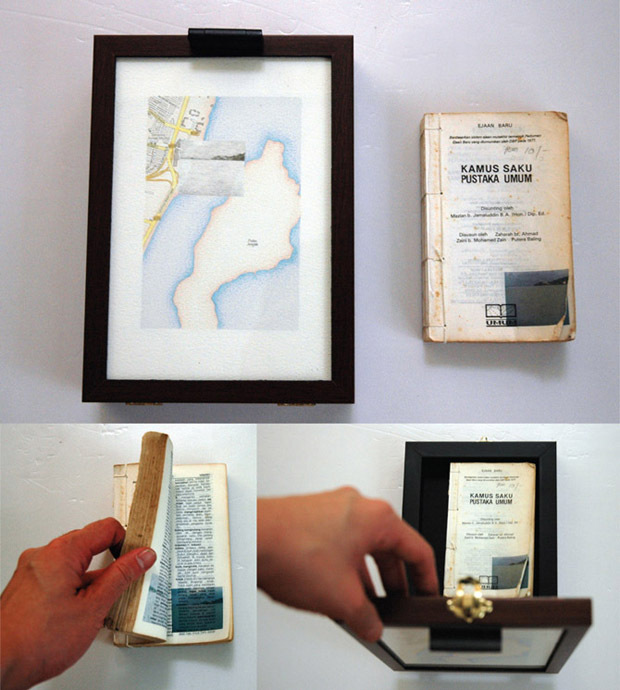 Pocket Seas: Pantai Pasir Panjang, 8:30am - Indonesian, 15.0cm x 19.0cm, Hand drawn map (graphite, color pencil and charcoal on paper), wooden box, hand-bound old dictionary printed with images transferred from mobile phone video. 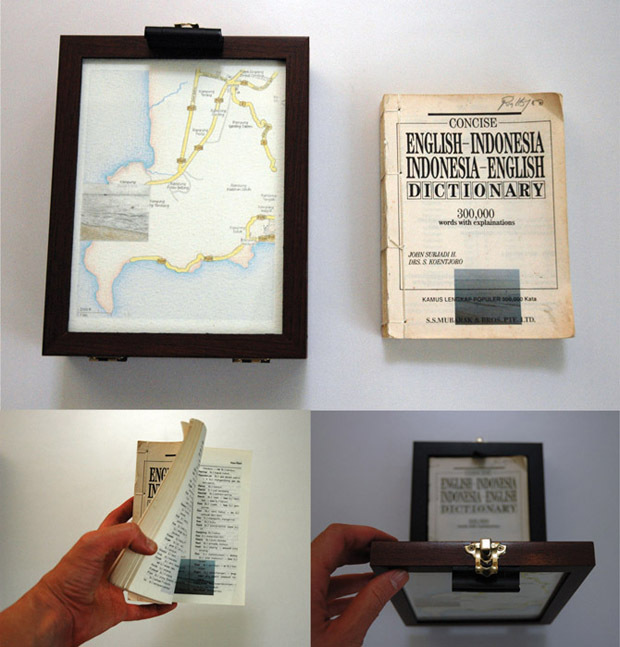 Pocket Seas: Teluk Bahang, 10:00am – Bawathit Word Bank, 13.0cm x 16.0cm, Hand drawn map (graphite, color pencil and charcoal on paper), wooden box, hand-bound old dictionary printed with images transferred from mobile phone video. 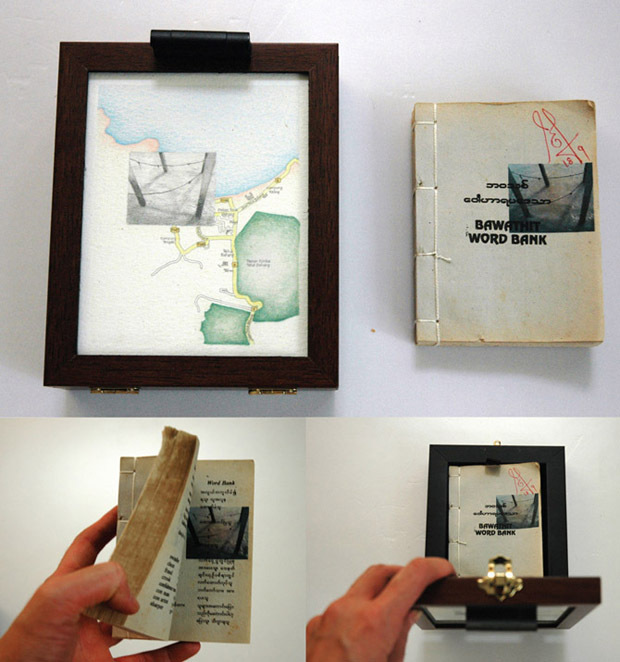 Pocket Seas: TBatu Ferringhi, 11:00am – Foreign Words, 13.0cm x 18.0cm, Hand drawn map (graphite, color pencil and charcoal on paper), wooden box, hand-bound old dictionary printed with images transferred from mobile phone video. 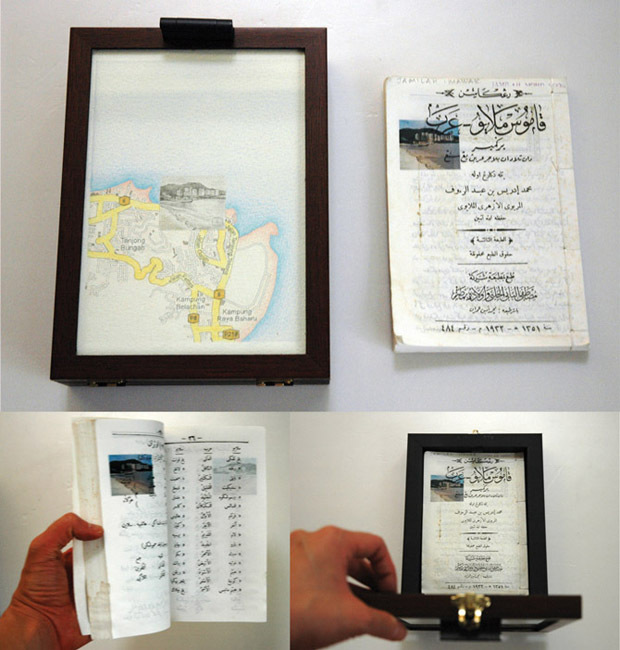 Pocket Seas: Tanjung Bungah, 11:30am – Jawi, 16.5cm x 22.0cm, Hand drawn map (graphite, color pencil and charcoal on paper), wooden box, hand-bound old dictionary printed with images transferred from mobile phone video. 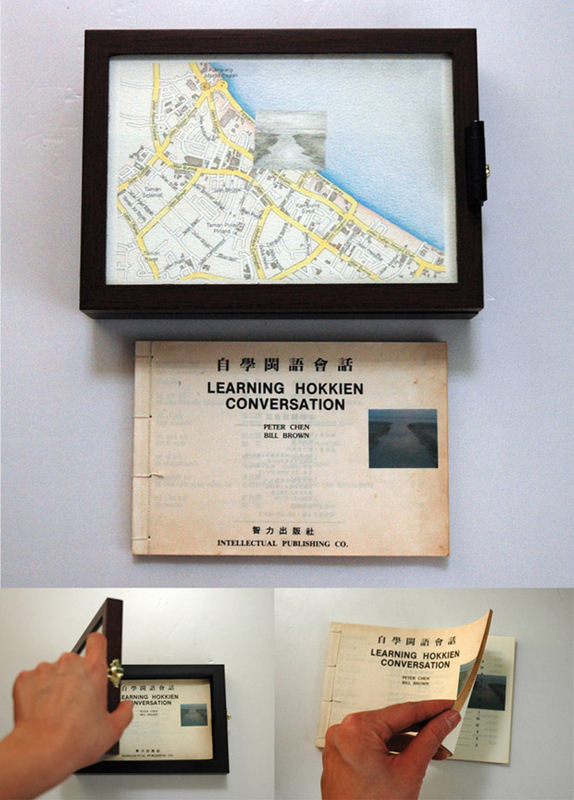 Pocket Seas: Gurney Drive, 12:08pm – Hokkien, 22.5cm x 16.0cm, Hand drawn map (graphite, color pencil and charcoal on paper), wooden box, hand-bound old dictionary printed with images transferred from mobile phone video. 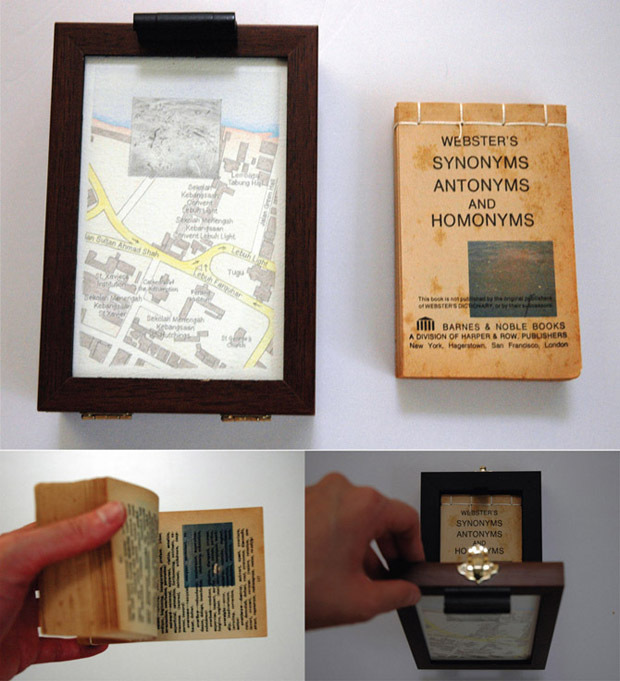 Pocket Seas: Convent Light, 12:30pm – Synonyms & Antonyms, 12.0cm x 16.0cm, Hand drawn map (graphite, color pencil and charcoal on paper), wooden box, hand-bound old dictionary printed with images transferred from mobile phone video. 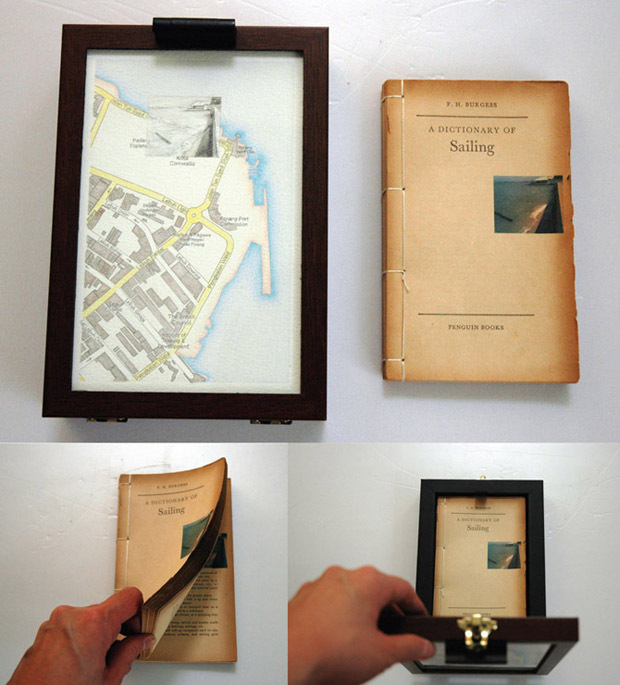 Pocket Seas: Fort Cornwallis, 1.40pm – Sailing, 15.0cm x 22.0cm, Hand drawn map (graphite, color pencil and charcoal on paper), wooden box, hand-bound old dictionary printed with images transferred from mobile phone video. 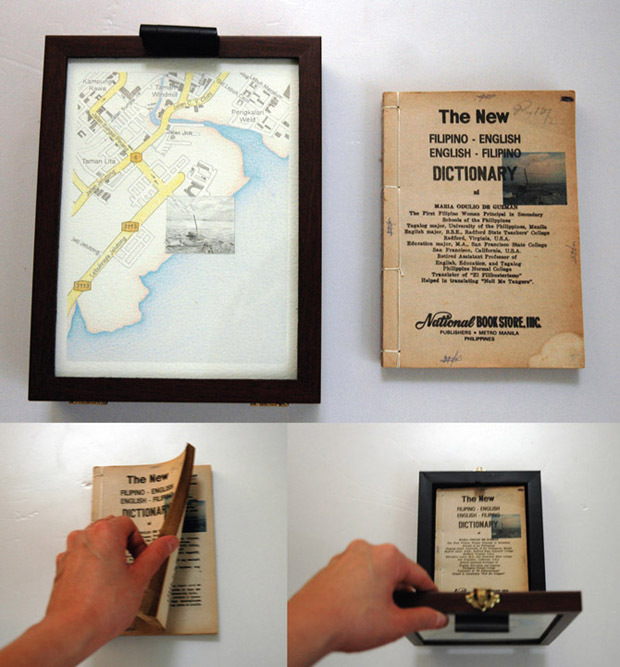 Pocket Seas: Lebuh Sungai Pinang, 2:00pm – Filipino, 16.5cm x 22.0cm, Hand drawn map (graphite, color pencil and charcoal on paper), wooden box, hand-bound old dictionary printed with images transferred from mobile phone video. Pocket Seas: Queensbay Mall, 4:25pm – Malay, 16.0cm x 22.5cm, Hand drawn map (graphite, color pencil and charcoal on paper), wooden box, hand-bound old dictionary printed with images transferred from mobile phone video. 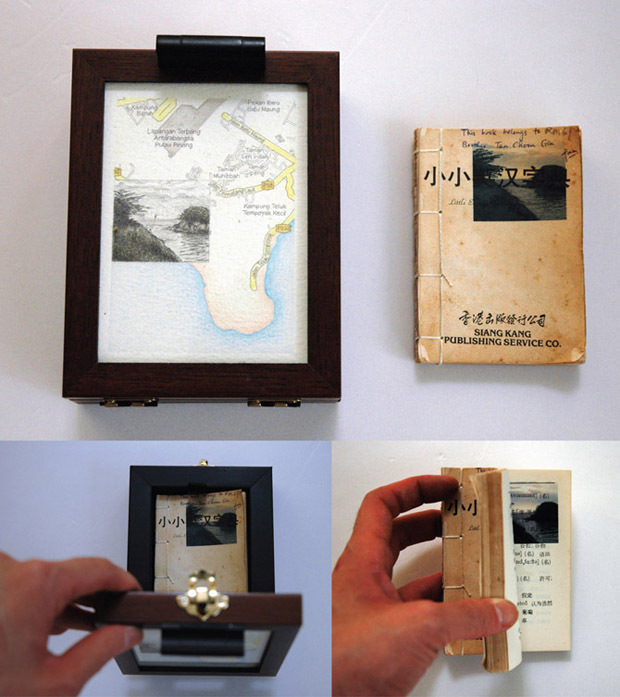 Pocket Seas: Batu Maung, 4:45pm – Chinese, 11.5cm x 14cm, Hand drawn map (graphite, color pencil and charcoal on paper), wooden box, hand-bound old dictionary printed with images transferred from mobile phone video. 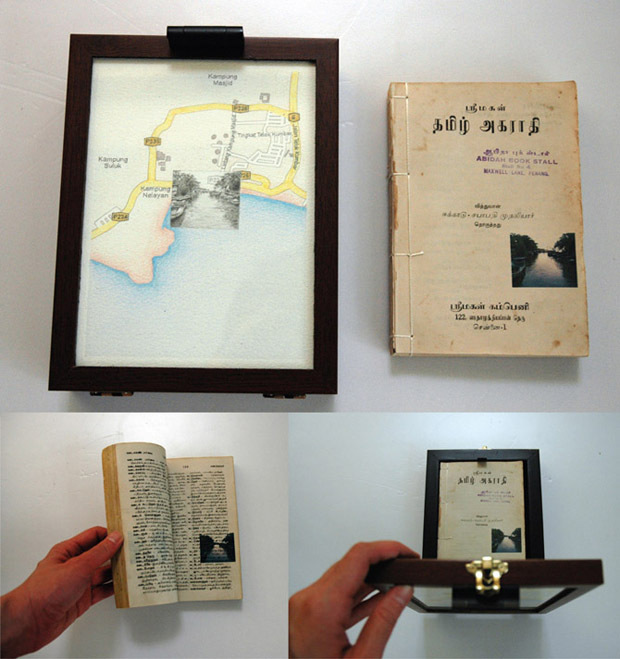 Pocket Seas: Teluk Kumbar, 5:15pm – Tamil, 16.0cm x 21.0, Hand drawn map (graphite, color pencil and charcoal on paper), wooden box, hand-bound old dictionary printed with images transferred from mobile phone video. 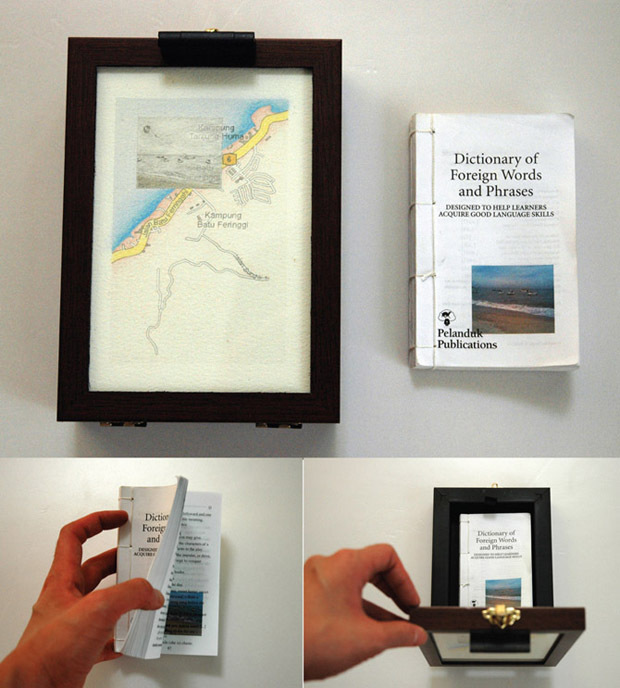 Pocket Seas: Balik Pulau (Malihom), 6:55pm – Textbook, 17.0cm x 22.5cm, Hand drawn map (graphite, color pencil and charcoal on paper), wooden box, hand-bound old dictionary printed with images transferred from mobile phone video. 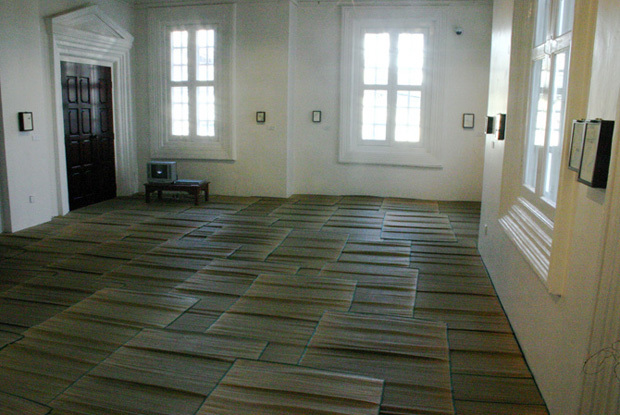 Installation view at RBS Bank building, Georgetown. Documentation of filming for Pocket Seas. Photos by Gabrielle Bates. Of the many things brought along when moving to a foreign land, language is the one closest to us. It resides deeply in the body, spirit and mind. When these arrive in the new land, language arrives too. In 2008, I spent 4 months on Penang island, whose capital Georgetown, is one of Malaysia’s three UNESCO World Heritage Sites. Having come from Kuala Lumpur on the mainland, I became aware of being surrounded by water on all sides. At the famous Chowrasta market, I found old dictionaries in the musty warrens of secondhand bookstalls. I imagined these languages floating in the sea towards Penang, and landing on its shores. 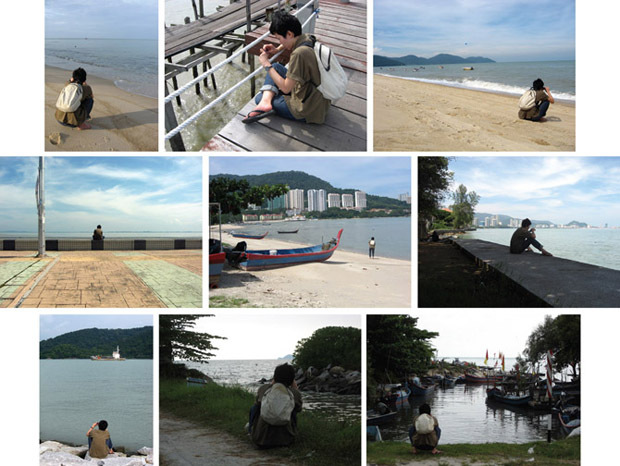 With my mobile phone, I went around Penang in a clockwise direction, and filmed videos of the sea in 12 different locations – one for each of the dictionaries. Each video was transferred to an image sequence, and individual frames were printed on the pages of the dictionaries. By flipping through the pages of the altered books, you could see the sea move. Each language is an ocean … when it is in dictionary form, this ocean fits in the pocket, like a mobile phone. The works were shown as an installation in a solo exhibition titled Pendatang/Arrivals, at RBS Bank in Georgetown. Common grass mats covered the floor and videos of the sea played on a TV in the corner. This project was completed under the RBS-Malihom artist residency programme. ‘Pendatang/Arrivals: Pocket Seas‘ series was shown in Immaterial Frontiers 2.0 at National Visual Art Gallery of Malaysia in 2014.